Between a consistent oral hygiene regimen at home and regular teeth cleanings at the dentist, you may be wondering if there is anything else that can be done to help prevent decay. While sealants are commonly used to treat children's teeth, adults can also have dental sealants applied in order to reduce their risk of cavities. Whenever you eat, bacteria take the sugars from food particles and release acid, which causes decay of the enamel and eventually cavities. Molars have small grooves on their surface, which can trap food and plaque, and cleaning these grooves can be difficult, making your molars more susceptible to cavities. However, dental sealants can seal off these grooves in your teeth, preventing food and bacteria from hiding in those hard to reach places. 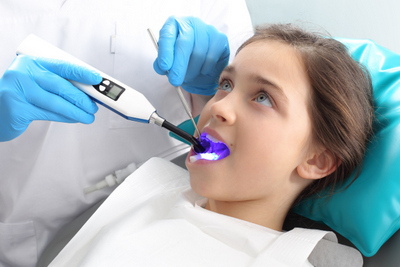 According to the Journal of the American Dental Association, sealants help "reduce the risk of cavities by 80%." Before the sealant is applied, the tooth needs to be prepared by placing gel on a tooth that has been cleaned and dried, and this will help the sealant adhere to the tooth. Next, the tooth is washed off one last time before the sealant is applied, and once the tooth is clean and dry again, the tooth is coated with the sealant material. The final step is shining a light on the coating so that it hardens, bonding the material to the tooth and creating a seal. Sealants are most effective when applied earlier in life, soon after the permanent molars emerge, but some adults can benefit from sealants. If your teeth are cavity-free, you may be a good candidate for sealants to help prevent future decay. Even if you do have mild decay on your teeth, sealants occasionally are placed on these teeth to prevent the decay from progressing further. If you have questions about how dental sealants can help protect your teeth, contact our office at (425) 998-6998, and we can help you determine if sealants are the right treatment for you.